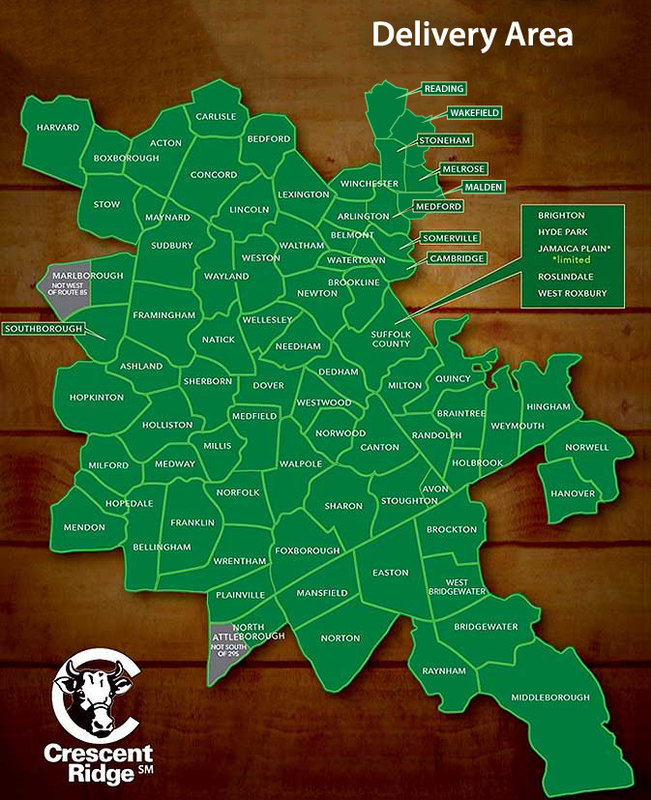 Recipe Beef :: Crescent Ridge Dairy - Serving Greater Boston with home delivery of milk, meat, and more! 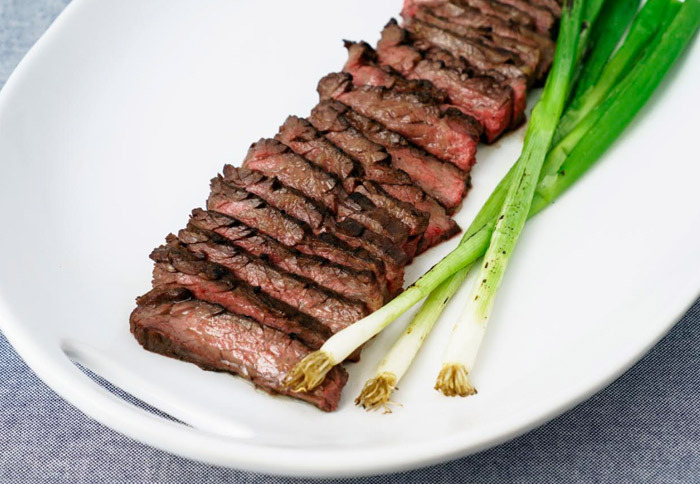 Known to some as sirloin tip, our own farm-raised flap meat is a tender, full-flavored steak that’s perfect for slicing and sharing. Tossed in a bit of soy & lime dressing (recipe below), the meat is as delicious out of the fridge as it is fresh off the grill. Pack it for picnics and meals on the go, or serve it at your next family gathering! 1. In a small bowl, combine the garlic, oil, salt, cumin and pepper (optional) to form a paste. 2. Pat the meat dry with paper towels and rub it all over with the spice paste, concentrating a bit of the paste at the thickest part of the meat. 3. Transfer the seasoned meat to a plate or baking dish. Cover with plastic wrap and transfer to the refrigerator for 4 hours to 24 hours. 5. Pat the meat dry with paper towels, taking care to remove the garlic chunks from the meat’s surface. 6. Cook the meat on the hot side of the grill for 8 to 11 minutes (flipping the meat every 1 1/2 to 2 minutes),* until the thickest part of the steak registers 130°F for medium rare. If the outside begins to char too rapidly, move the steak to the cool side of the grill and continue cooking. 7. Transfer the meat to a plate or platter and loosely tent with foil for 5 to 10 minutes. The steak will have released a considerable amount of juices. 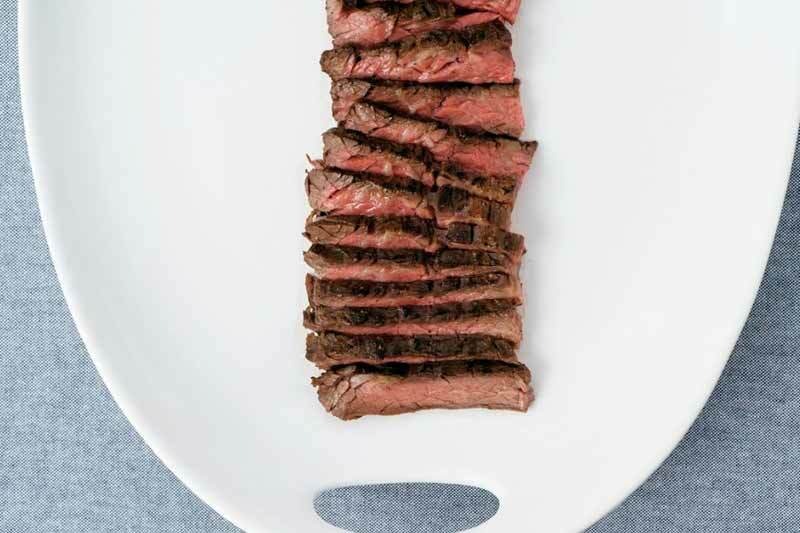 To prepare the steak in the broiler, preheat broiler and cook for 8 to 11 minutes as directed in step 6. Whisk the soy sauce, lime juice, oil, ginger and garlic together in a small bowl. Adjust the flavors to your liking. 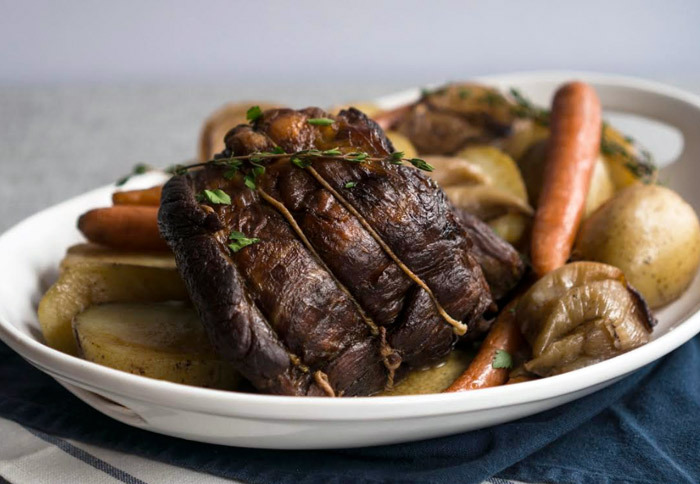 A low-and-slow oven transforms our own farm-raised beef roast into a melt-in-your-mouth braise of meat, vegetables and a rich beefy broth to spoon over them. Serve with sweet green peas, bread and butter for a hearty winter meal. *rump and bottom round roasts make an excellent substitute. 2. Heat the oil in a large frying pan over medium-high heat. Pat the roast dry with paper towels and sprinkle it all over with the salt. 3. When the oil shimmers, add the roast to the pan and brown it on all sides (about 10-12 minutes). Transfer to the baking dish, fattiest side up. 4. Continuing in the same frying pan, brown the onions, cut side down, for 1-2 minutes. Arrange them in the baking dish around the roast, cut side down. 5. Pour off and discard the grease from the frying pan. Pour the wine into the pan and scrape up the browned bits with a wooden spoon. 7. Halve the potatoes and arrange them with the roast, onions, and juices. Tuck the carrots into the empty spaces (it’s okay to pile them a little). 8. Cover again with the foil and continue baking for 1 hour and 15 minutes, until the potatoes and carrots are fork-tender. 9. Transfer the roast to a cutting board and tent with foil for 20 minutes. 10. Carefully move the vegetables to a serving platter. Cover with foil to keep warm. 11. Degrease the braising liquid by either pouring it into a fat separator, or skimming the fat with a spoon. You should have about 1 1/2-2 cups of liquid. 12. Remove the strings from the meat and carve against the grain. Transfer to the serving platter and drizzle with half of the braising liquid to keep moistened. 13. Serve immediately with the parsley and remaining braising liquid. 1. Place the bacon ends into a large heavy-bottomed pot. Crank the heat to medium and allow the bacon to cook for 6-10 minutes, until most of the fat has rendered. The bacon should be on the verge of chewy and crisp as it sizzles in about 4-5 tbsp of its own fat. 4. Add the ground beef and pork to the pot. Season with the remaining 1 1/2 tsp of the salt and a few grinds of black pepper. Toss and mash the meat mixture with a wooden spoon until the meat is no longer pink and most of the liquid has evaporated, about 5-10 minutes. 5. Pour in the white wine and simmer, stirring occasionally, until the liquid has cooked off, about 30 minutes. 6. Stir in the crushed tomatoes and water. Crank the heat to low and simmer, partially covered, for at least 1 1/2 hours at a lazy, gentle simmer. Stir occasionally to keep the sauce from sticking to the pot. The sauce is ready when you see little pools of grease bubbling at the surface. 7. 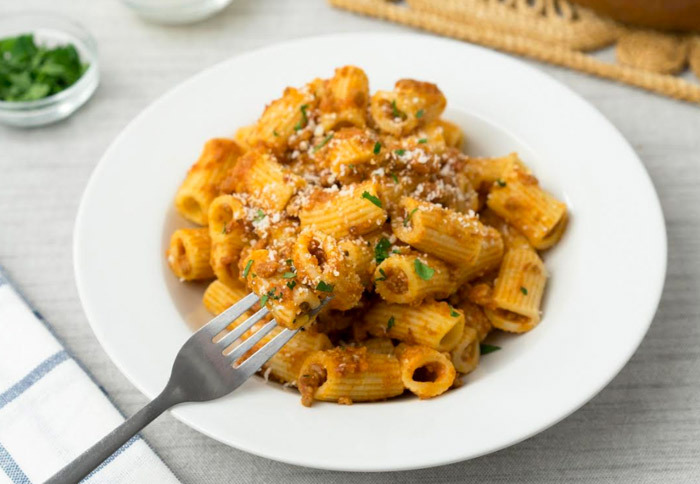 Refrigerate leftover sauce in an airtight container for up to 5-7 days, or freeze for as long as you can resist eating it! *Look for bacon ends with equal parts fat and lean meat. If your ends are on the leaner side, supplement the fat with a bit of olive oil for sautéing the vegetables. bacon ends: cut into scant 1/2-inch batons. Pop into the freezer for 15 minutes, then pulse in the food processor until the pieces are slightly larger than 1/8 inch all around. onion, celery & carrot: working one vegetable at a time, cut into 1/2-inch chunks. Pulse in the food processor until the pieces are about 1/8 inch all around.